♚【Upgraded Edition】 EATOP's 128GB USB 3.0 Flash Drives Offers More External Space for iPhone, iPad, iPod, Android & Computers, More Stable And Faster Transmission,18 Months After-Service. -In your office, outdoor, travel, airplane, home, USB flash drive for iPhone is your best companion. 1. Built in Micro SD card with FAT32 and exFAT, NTFS not supported. 2. iOS flash drive Excellent solution for transferring files, videos, pictures back and forth from your iPhone, iPad, Android Phone and your computer. 3. Read/write performance for iOS devices up to 35MB/s and 15MB/s. 4. Read/write performance for PC up to 85MB/s and 35MB/s. 5. Lightning connector - Ensure 100% compatible and syncs with Apple lightning devices, can be used as iPhone 8x 8 7 6 6s Plus 6 Plus 5s 5c flash drive, iPad Air Air 2 mini flash drive and more Android devices. 6. Fully compatible with windows XP / 7 / 8 / 10 / Mac OS. 8.Free and user-friendly "UTools" applications and automatically start iOS devices from the Apple Store. * iPhone Devices: Need to download the free APP "UTools" from apple store. 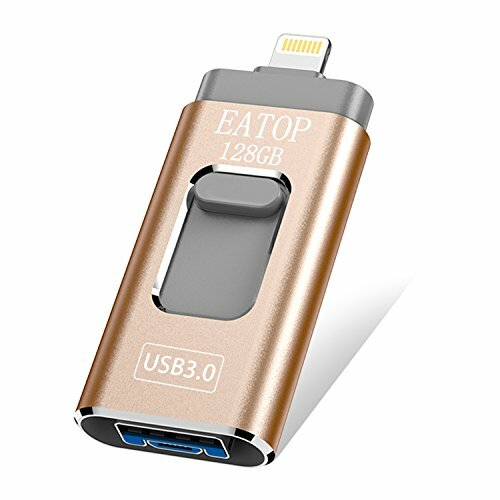 ♚【Upgraded Edition】EATOP's 128GB iOS Flash Drive Offers More External Space for iPhone, iPad, iPod, Android & Computers, More Stable And Faster Transmission,Let the phone no longer worry about lack of memory problems. ♚【Easy and Speedy Transfer】Directly plugs into your lightning port and USB port; experience up to 85 MB/s reading and 35 MB/s writing speed with USB port. ♚【Format-Friendly Streaming APP】The free "UTools" APP supports all major video and music formats so you can stream directly from the thumb drive, saving you precious space and time. ♚【User Friendly App With More Features】1.Take photos, videos and audios directly to external storage; 2.Thumb flash drive can open compressed files directly for easy browsing; 3.iPhone storage drive makes it easy to back up and manage files; 4.Encrypt single files in the flash drive; 5.iPhone memory stick can backup and restore contacts at one click; 6.Lightning flash drive Share files with social medias and other Apps. ♚【Compatibility and Warranty】Lightning connector - Ensure 100% compatible and syncs with Apple lightning devices, Made for iPhone X, iPhone 8, iPhone 8 Plus, iPhone 7, iPhone 7 Plus, iPhone 6 s, iPhone 6 s Plus, iPhone 6, iPhone 6 Plus, iPhone 5, iPhone 5 s, iPhone 5 c, iPhone SE, iPad touch(6th generation) iPad 4, iPad mini, iPad Air, iPad Pro, Mac OS 9.X or Later, Linux 2.4.x, iOS 8 or Later, Windows XP, Vista, Win 7, Win 10 and more Android devices. If you have any questions about this product by EATOP, contact us by completing and submitting the form below. If you are looking for a specif part number, please include it with your message.